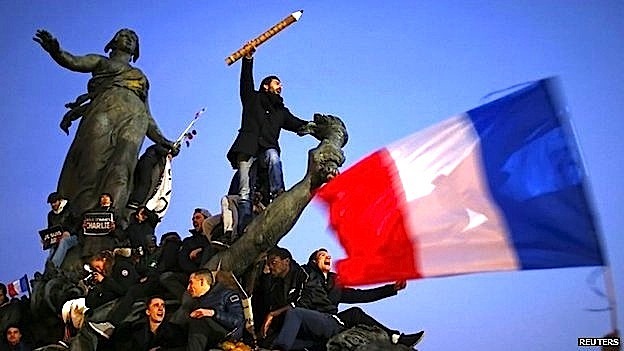 On Sunday almost four million French people showed the world how to stand up to terrorism: we saw the descendants of the 1789 revolution (strengthened by immigrants) do what they do best, be gloriously French and not in a frou-frou and foie-gras way. Parisiens traditionally demonstrate when they're pissed off about political issues and, with the memory of the guillotine still resonating, politicians often listen. On Sunday the whole world listened, everyone was impressed, everyone was Charlie. 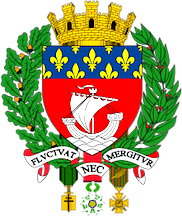 We were reminded who invented the phrases SAVOIR FAIRE, JOIE DE VIVRE and that the motto of Paris is FLUCTUAT NEC MERGITUR, shaken but not sunk. 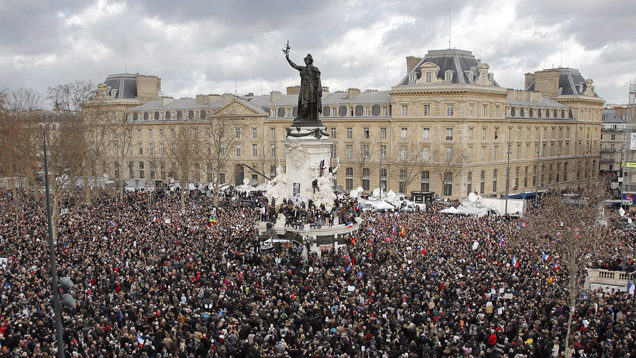 And, even though a little more EGALITE and FRATERNITE are needed to go with the great tradition of LIBERTE, (brought to mind by the names of the streets and squares where the people marched: Place de a République, Boulevard Voltaire, Place de la Nation) the massive march joined the many other historic events of this ancient nation. Time to change the label to "cheese-eating terrorist-defiers", don't you think? Je suis Musulman, pas de panique. Je suis Charlie, je suis flic, je suis juif. 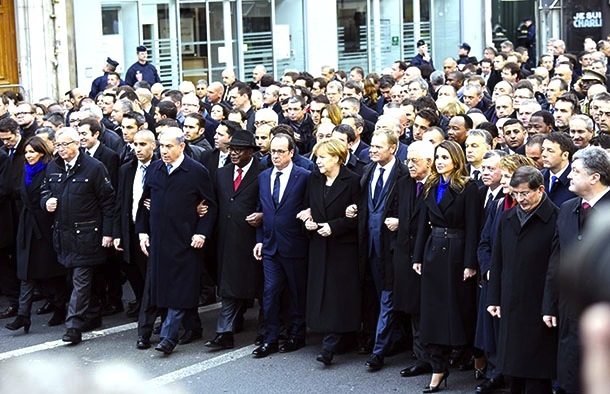 By the way, how shabby of US leadership not to participate. So disrespectful. On Wednesday, when CHARLIE HEBDO is published as usual, we'll continue to be CHARLIE by buying a copy and by subscribing. CHARIE HEBDO's cartoons may be offensive and vulgar and anarchistic, they may not be the most subtle or the height of cartoon art, but they represent the height of freedom of expression. When I hear people speaking prissiy about exercising "good taste" and "not asking for trouble" then denying that’s self-censorship, I want to take out my pencil and draw a cartoon. So, let's be CHARLIE today, tomorrow and next year. Let's give jobs to Muslims so they don’t have to change their name to d'Artagnan just to get an interview as did one enterprising French muslim, let's be more tolerant of differences and above all, let's not listen to the siren song of Marine Lepen.